In Part 1 of this two-part series we looked at some of the dominant technology trends over the last couple of years and the impact they are having on cameras and photography. In this part of the series, I write about my impressions of a few recent cameras that I have had the opportunity to use. Voted by Time Magazine as one of the best inventions of 2012 and declared to be the best pocket camera ever made by New York Times reviewer David Pogue, this camera has changed the way people respond to small sensor sizes. RX100 is a fixed zoom pocket camera with features and controls designed for enthusiast photographers. At 36mm thickness, it is just about small enough to fit into the front pocket of a pair of jeans without discomfort. Its claim to fame, though, comes from the fact that despite such a diminutive size, the camera’s 1 inch (13.2mm x 8.8mm) sensor delivers dynamic range and colour depth that matches that of the much bigger APS-C sensors, e.g. that of the Nikon D90. This excellent 20MP sensor is mated to an f/1.8-4.9 Carl Zeiss 3.6x zoom lens that is sharp enough to justify the super-high resolution. Another thing that RX100 does much better than the D90 and its bigger cousin NEX-5 is video recording. The video stabilisation on RX100 is amazing and the results from 50 fps 1080i video are striking. There isn’t much that this camera leaves to complain about. If at all, I sometimes find the minimum focus distance at tele end to be a bit too much. Indeed, the styling of the camera is admirable. Its modern machine tooled cuts combined with classic styling cues give it an intriguing and likable shape from the front and top. The rear side of the camera is dominated by the large LCD swivel touch-screen that makes it look and feel like a modern camera. The looks of the camera are enough to raise expectations from its performance, handling and IQ. Handling of this camera is quite good. Apart from the awkwardly placed on-off switch, everything is just about where it should be. The tilting LCD screen offers a better shooting experience than the built-in 1.4M dot EVF, though the latter may be used for extra stability. While using the LCD, you can also use the touch-to-shoot functionality to focus on a desired point in the scene and shoot. The E-M5 features hybrid AF (on-sensor phase detect + contrast detect) that is very fast to lock on and quite accurate. The 16MP imager has great colour depth and high ISO performance. The JPEG engine from Olympus also retains its characteristic colour response to give pleasing images straight out of camera. It did have some issues with auto white-balance under fluorescent lighting. Another first in the E-M5 is the 5-axis in-body image stabilisation. While most IS systems only compensate for yaw and pitch, the E-M5 compensates for yaw, pitch, roll and horizontal and sideways translation movements. This works very well for shooting stills, and also for shooting video. However, the RX100 still outclasses the E-M5 in video shooting for one basic reason — continuous tracking AF in E-M5 is very, very slow, at least with indoor lighting. 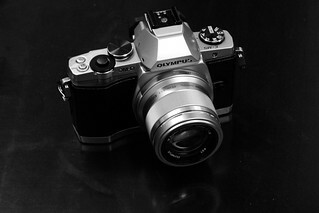 Overall, this is a very attractive camera and just by its looks and handling, it inspires one to shoot. However, it’s still a bit rough at the edges and things like iffy AWB and slow focus tracking can be a bit disappointing. Nevertheless, this is the first camera from the FourThirds stable since the Panasonic GF1 that has held my attention and is having me think of switching to the MFT stable instead of Nikon APS-C. The Nikon 1 J1 is a strange camera in many ways. In photographs, it appears to be all cutesy and properly small, in line with other compacts. When you see it in real life (I was going to say, “flesh and blood”, but stopped for obvious reasons), it turns out to be rather big and very solidly built. The most striking thing about the J1 is its build quality. It is crafted out of seemingly thick metal, with large, nicely tooled buttons on top. The back-plate has some more large and well constructed buttons, along with the LCD screen. It makes the very solidly built Sony RX100 feel like a flimsy little thing. So, the J1 is uncharacteristically well built. What about the performance? It has the same sized sensor as RX100 but whereas RX100 only does contrast detect AF, the J1 has hybrid (phase detect + contrast detect) AF like the OM-D E-M5. This does result in super-fast focusing with a high level of accuracy. Raw IQ is excellent and matches that of the RX100 where low light is concerned. At base ISO, RX100 has higher colour depth and dynamic range, though. The camera is also capable of up to 60 fps frame burst, which enables it to offer interesting features like Motion Snapshot and Smart Photo Selector. That’s not all, the camera can also shoot 400 fps videos at 240p and 1200 fps videos at 120p. For all this performance, though, it doesn’t offer exposure/WB bracketing or in-camera HDR, which brings us to the next point. The J1, unfortunately, is a bit of a strange camera for another reason. It’s designed for P&S upgraders and novices, but requires an enthusiast — a tinkerer — to get the most out of it. The metering and AWB of this camera are both unremarkable, making it necessary to shoot raw and use EV compensation more often. That, however, is a problem because the camera being designed for novices, doesn’t offer an up-front control to set EV compensation. The high speed videos look like an attractive prospect, until you discover the amount of ambient light the camera needs to be able to capture them. Another trade-off between RX100 and J1 is that of size vs. versatility. The J1 is big, compared to RX100 (though smaller than Olympus E-PM2) and its lenses are bigger still. But for the added bulk, you do get the ability to choose between not just the interesting Nikon CX lenses like the 18.5mm f/1.8 or the announced 32mm f/1.2, but with the FT1 adapter, you can also get your Nikon DX and FX lenses to work with it. Overall, it’s a very interesting camera and for its now discounted price, it offers a great value proposition. Indeed, it’s the best selling mirrorless ILC in Japan by a healthy margin. If you are looking for a pocket camera and are willing to spend the money, I can recommend the RX100 without reservations. It does what a pocket camera should do, and then some more, with uncompromising IQ on-the-go. APS-C: This includes Sony NEX, Fuji X and Samsung NX bodies. With a big sensor comes the burden of big lenses. None of the manufacturers in this segment have managed to address lens size issues satisfactorily, though Sony made some progress with its 35mm f/1.8 prime and 16-50mm collapsible zoom. If you’re going mirrorless to reduce size, you might want to consider the entry level DSLR bodies, which aren’t significantly larger but offer better value for money. Nikon CX: being a Nikon guy, I am watching this mount with interest. The RX100 has shown the potential of a sensor of this size, and I can happily live with the IQ it returns. The CX lens selection is sparse at the moment, but at least they are sufficiently small, even with VR. The AF and continuous shooting performance of Nikon 1 bodies is beyond anything in its price bracket, or even higher. I would have gone for the Nikon 1 V2, but the lack of exposure bracketing and/or multi-shot exposure modes a la Sony’s Superior Auto is a deal-breaker for me. Let’s hope Nikon addresses this concern soon enough.